Listener Al Masciocchi sends along this photo of a plaque on a building in Baltimore. “I never knew much about St. Joseph until earlier this year. We were visiting my daughter who had recently moved to Baltimore and while out for a walk passed a Catholic Church. I don’t remember the name of the church but the church hall across the street was named “St. 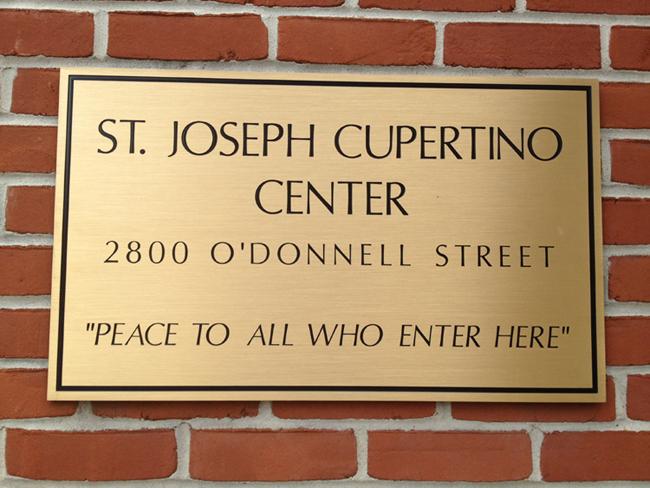 Joseph of Cupertino Hall”. I yelled when I saw it and pointed it out to Cathy. Now, a priest was standing outside the church as this was Sunday morning and Mass was starting in 5 minutes. I immediately went over to him to ask him about the hall, telling him of my long and fond association with St. Joseph. He asked me if I knew the rest of the story. When I said I didn’t he told me that Joseph wanted to be a priest but he was ‘dumb as a rock’ but through some family connection was allowed to apply and had to take a test. He only studied the first chapter in the book but succeeded anyway. Categories: Listeners respond | Permalink.